AbysSound are a brand hardly known outside their native Poland. We encountered products bearing their name at two occasions. Both were installments of the Warsaw Audio Show. 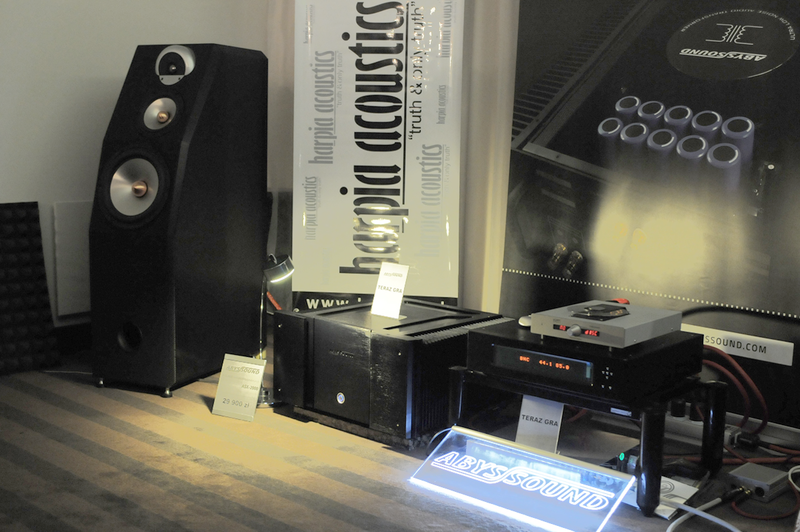 The first setup where we met AbysSound was in combination with Acoustic Zen Crescendo MKII loudspeakers below showing a duo of ASX-2000 80wpc stereo power amps on duty. It was no surprise that these bi-amped Crescendos had no problem filling their large room. At that same show another room with Harpia Doberman loudspeakers [next image down] also used an ASX-2000. A year later AbysSound was present again, this time focusing on the benefits of vinyl over digital playback. Of course their flagship power amp was used again but this time in combination with the company’s prototype loudspeakers. After hearing the amplifiers in a few different environments and combinations, the answer to the question whether we would be interested reviewing the ASX-2000 in our own surroundings was not hard: of course. Arrangements were made but it took some time to effectuate them. When the amplifier arrived by courier, we received a sturdy flight case with ample grips to manage the 52kg net weight. Thanks to these grips, the hoist upstairs was possible. However, we still borrowed some extra muscle from next door. Fortunately the back of the ASX-2000 is equipped with two large handles. Unpacking it from the snug-fitting protective case was easy. We then placed the amp on a trolley to make shifting the big and heavy device easier. That’s because we were planning on operating the amp in more than one setup. With its black finished aluminium outers, the looks of the ASX-2000 are neither spectacular nor boring. The word ‘classic’ comes to mind. Measuring 54cm wide, 27.5cm high including feet and 48cm deep excluding handles, the amplifier is large but falls in the same size category as, say a Pass Lab Xs Series amp. The partly doubled 2cm thick front plate acts as added heat sink and sports the standby switch. Whilst in standby mode, the blue LED in that switch blinks slowly and with non-intrusive intensity. Activating the switch turns the LED solid and triggers a few relays to modestly click. 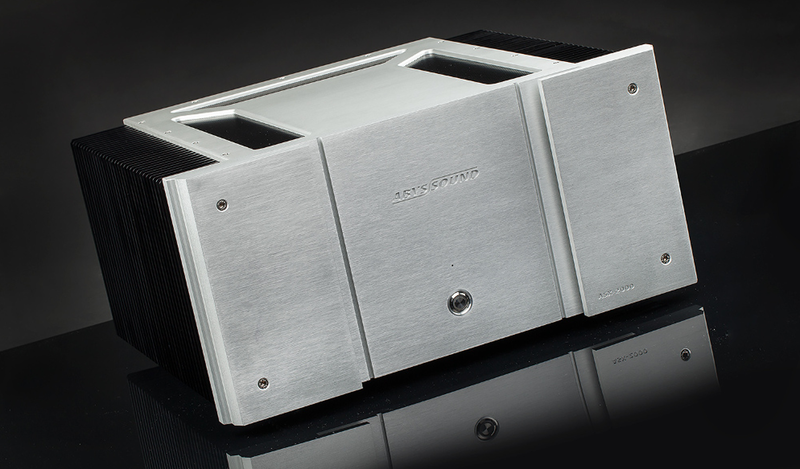 Both sides of the amplifier are fully covered by 6.5cm deep cooling fins with softly rounded edges. The top plate is equipped with three mesh-covered cooling slots. Over at the business end there are two 5-way binding post pairs with ‘protective’ plastic shrouds as per Brussels’ decree, a remote trigger connection, the IEC power inlet with mains switch and fuse and above that the pair of RCA single-ended line inputs. At the bottom of the back plate sits a ground lift switch in case a ground loop spoils your musical pleasure. All these cooling facilities are there for good reason. The ASX-2000 runs in full class A for its entire 80wpc power envelope. And that bias generates a substantial amount of heat. Using the extensive heat sinks, the designer keeps his surface temperature around 40°C. As a consequence, this amplifier should be placed where there is plenty of air around it and away from other heat sources.